We went up to the end of Cecil Road to the Orange Christian Ministry Centre and there were kites flying high. There was the parachuting Teddy and some other amazing designs. A huge tent was filled with activities for children and some rather funny clowns who wanted to make animals out of sausage balloons. 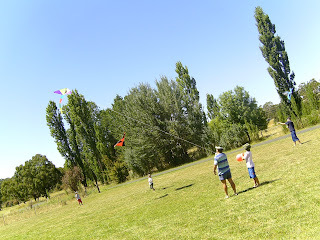 We even had the chance to learn how to make a kite from scratch and then go outside and fly it. There was music, food and games and amazingly it was all free. It was a day which brought us outside to share some quality time with our children, it definitely has the thumbs up from our family.